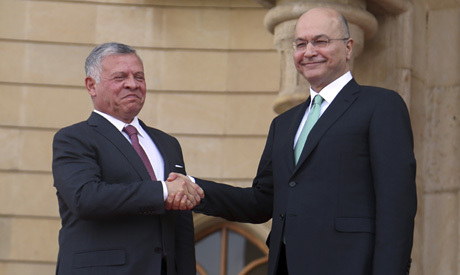 Jordanian King Abdullah II met Iraqi President Barham Saleh in Baghdad on Monday, according to state television, in the monarch's first trip to Iraq in more than a decade. The visit is the latest in a string of top-level diplomatic encounters in Iraq in recent weeks, which kicked off with a surprise Christmas trip by US President Donald Trump. King Abdullah's last trip to Iraq was in 2008, when he became the first Arab leader to visit Baghdad after strongman Saddam Hussein was toppled by the US-led invasion in 2003. Saleh travelled to Jordan in November. The two countries share a 179-kilometre (111-mile) border, and Jordan is a major importer of Iraqi crude oil. In 2013, they agreed on a 1,700-kilometre pipeline linking Iraq's oil-rich Basra province to Jordan's Aqaba port, but the Islamic State group's sweep across nearly a third of Iraq put a screeching halt to the plan. Last year, Jordan approved a framework to revive it, but did not give a timeframe for the line's construction. The two states have also discussed plans for Iraq to import around 300 megawatts of electricity from Jordan to cope with widespread power shortages. Currently, Baghdad relies heavily on its eastern neighbour Iran, importing around 1,300 megawatts of electricity and 28 million cubic metres of natural gas to feed power plants. Washington, which sees Tehran as its top foe in the region, is keen to break those ties. It reimposed tough sanctions on Iran in November but has granted Iraq a temporary waiver on energy imports, while urging it to partner with US firms instead. "Everyone is looking to Iraq as a virgin land requiring more investment by regional and international powers," said Iraqi political analyst Issam al-Faily. "Jordan has a real desire to stretch an oil pipeline from Basra to the Aqaba port because it would fulfil its fuel needs," he told AFP. Iraq has witnessed a revolving door of diplomatic visits since Trump's late December visit. US Secretary of State Mike Pompeo made a surprise stop in Baghdad on his regional tour last week, followed by Iran's oil minister then top diplomat Mohammed Javad Zarif, who landed Sunday.